The story goes that for decades, Republican leader Don “Doc” Adams (Lith. Adomaitis) of Springfield exercised significant patronage power in both the public and private sectors. When “Doc” died in 2011 at age 75, his obituary listed leadership roles with the Illinois State Republican Central Committee, the Illinois Republican State Convention, the Illinois Electoral College, and the Republican National Committee. These roles put him at the heart of city, state and national politics for decades. Pretty good for the grandson of a Lithuanian immigrant killed in our local mines. But maybe not surprising to those who knew “Doc” as the product of the union of two families, the Adams-Adamitises and Yates-Yacubaskies, who had been working together since the early 1930s on their joint economic and political climb up from the mines–through bootlegging and the grocery/tavern business–to the ultimate prize of patronage-rich politics. On the Adams side, the story begins with “Doc’s” grandfather, immigrant coal miner John Adamites (Adomaitis), who died in 1907 as a result of an accident at Springfield’s Illinois Midland Coal Co. mine, leaving behind a widow and four children. One of those was “Doc’s” father John Joseph Adamitis, who was born in 1899 and served in World War I. In the early 1920s, newspaper reports also say that a John Adomaitis sang in the locally renowned Knights of Lithuania (K of L) Branch 48 choir. In 1925, he was elected president of the local branch following the branch’s leadership by the charismatic Lithuanian composer Alexandras Aleksis. In the early 1930s, it appears that John began to build his Knights of Lithuania support into a base for entering traditional party politics in the wider community, along with his wife and two of her brothers, Joseph and William Yacubasky (Yates). It’s likely that John liked his first taste of politics inside the K of L. It’s also my hunch that after facing raids, imprisonment and fines from government authorities over the alcohol business during and after Prohibition, Adams and the two Yates brothers decided it was time to get some of that political power–and protection–for themselves. 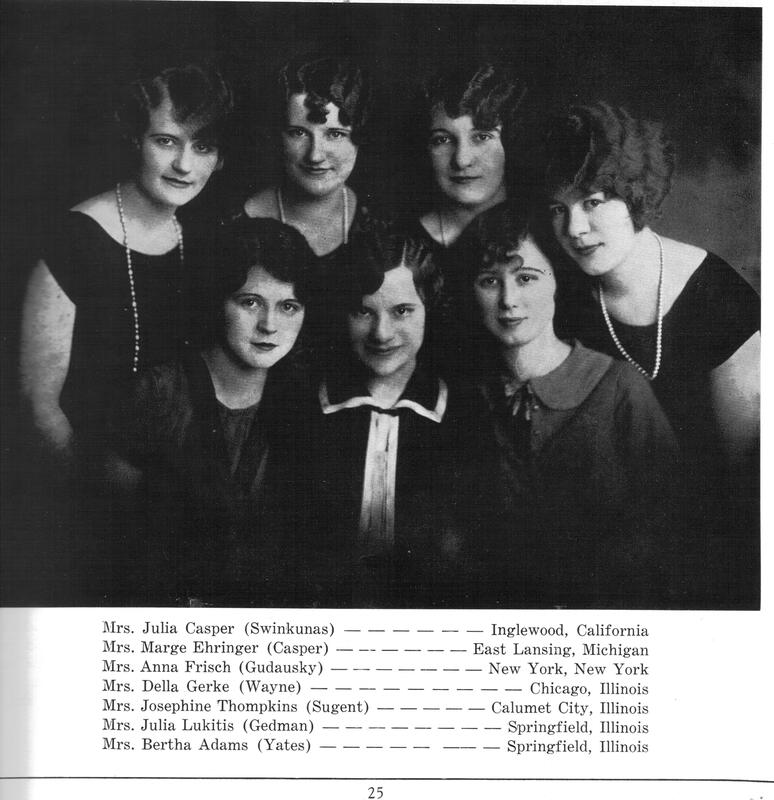 So, in 1931, the three men and Bertha (who had also been involved in the Knights), along with other Lithuanian-American businesspeople and neighbors from the North 17th St. area, founded the Lithuanian Social and Political Club of Sangamon County. This was one year before the infamous central Illinois “Mine Wars” (1932-36) broke out. I can only wonder what impact the Mine Wars had on this fledgling ethnic political organization, at a time when the strife between the United and Progressive Mine Workers unions tore many ethnic groups, neighborhoods, and families apart. The beautiful Bertha (Yates) Adams, right edge, front row, with friends from St. Vincent de Paul Church, circa 1930. Although the original group first met in 1931 at the Labor Temple at 6th and Washington streets, by 1936 the organization was renamed the Lithuanian Republican Social Club and was meeting at the Arion hall to hear an address criticizing Franklin Delano Roosevelt and The New Deal. John Adamitis was the chairman of that meeting at the Arion, supported by committee chairpersons Mrs. Joe Welch (Wilcauskas), William Yates, William Stankavich, and Mrs. Wallace (Julia) Olshefsky. Subsequent meetings, according to the newspaper, were held at Republican headquarters on the west side of the (Old State Capitol) square. There were also many picnics and other social events to gather and galvanize the Lithuanian-American Republican faithful, including food, musical performances, and games and activities for children. Here our story backtracks to “Doc’s” maternal line, the Yacubasky-Yates family. Tony (Antanas) Yacubasky immigrated to the U.S. in 1890. His first stop was the Shenandoah, Penn., coal fields, where he married Mary Lesko and two of the couple’s three daughters were born. In 1906, the family moved to 1501 Pennsylvania Ave., (the same block where my mother grew up). Sons Joseph and William were born. The Yates family were co-founders in 1931 of the aforementioned Lithuanian Social and Political Club. After serving as a Republican precinct committeeman for several years, 25-year-old William was selected the Republican candidate for county auditor in 1932. After his election defeat, William was appointed deputy probate clerk. In 1933, as Tony Yacubasky and sons Joseph and William prepared to advance their family even more ambitiously in business and politics, they saw becoming more publicly “Americanized” as a critical component and filed in circuit court to change their surname to Yates. However, as early as December 1934, The Blue Danube was caught in a liquor license dispute between Springfield Mayor John Kapp and the city’s liquor board. The Yates family claimed that they had paid the city clerk for their license, which was never issued, and that they were operating under a personal pledge from Mayor Kapp. The licensing board cited The Blue Danube not just for the failure to have a license to sell alcohol, but also for hosting dancing without a permit and serving alcohol after 1 a.m. The establishment’s windows were also cited because they did not provide a good view into the club from the street—-thereby making it easier to serve alcohol after hours without detection. In 1935, at age 68, immigrant Tony (Antanas) Yates died. Perhaps as a result of this loss and ongoing “political” troubles, in 1938, The Blue Danube was sold to Kenneth Goby and Harold Cusick–reportedly, so that Joseph Yates could devote all his time to the grocery side of the family business. By 1942, Joseph’s brother William was chairman of the central committee of the Sangamon County Republican Party. Joseph had closed the Keys Ave. grocery and enlisted to serve in World War II. He is reported by the newspaper to have rushed home to his ill mother’s bedside, with the aid of the Red Cross, just before shipping off to military service. The brothers later operated Y-B Market at First and North Grand Ave. and the nearby Ann Rutledge Pancake House, the most wonderful restaurant in Springfield, for many years as they continued in Republican politics. I would guess that when it was his turn to carry on—and build upon–his father’s and uncles’ political legacy starting in the 1960s, “Doc” Adams got a nice leg-up from the Republican contacts and organization his three elders had formed. 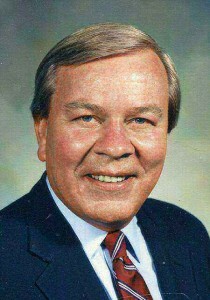 However, although “Doc” no doubt wore their mantle as he entered politics, it’s a testament to his own hard work and political skills that he managed to eclipse the wildest dreams of his immigrant/ethnic forebears by serving and leading the Republican party both locally and nationally for more than 30 years. Many thanks to Tom Mann for finding State Journal-Register articles that contributed mightily to this post. Interesting post! You must have had to do some real digging to put all that together. Enjoyed it!